how to integrate Discovery Education Streaming media, Google Earth (to building a Google Lit Trip, embed images, video and fly overs), VoiceThread, podcasting, and Edmodo to promote meaningful communication about literature between students and teachers…by examining the tools and sharing implementation strategies while focusing on curriculum integration. And it did. I have sat in many Google Lit tours over the years, but they just flew too fast for me. Howard’s presentation was slow enough to absorb. A veteran presenter, Howard surveyed his audience and knew many of his viewers were new to the process he was describing. We all benefited from the kinder pacing of this presentation. Thank you so much, Howard. New tools for interacting with students about literature are both welcome and necessary in the classroom. 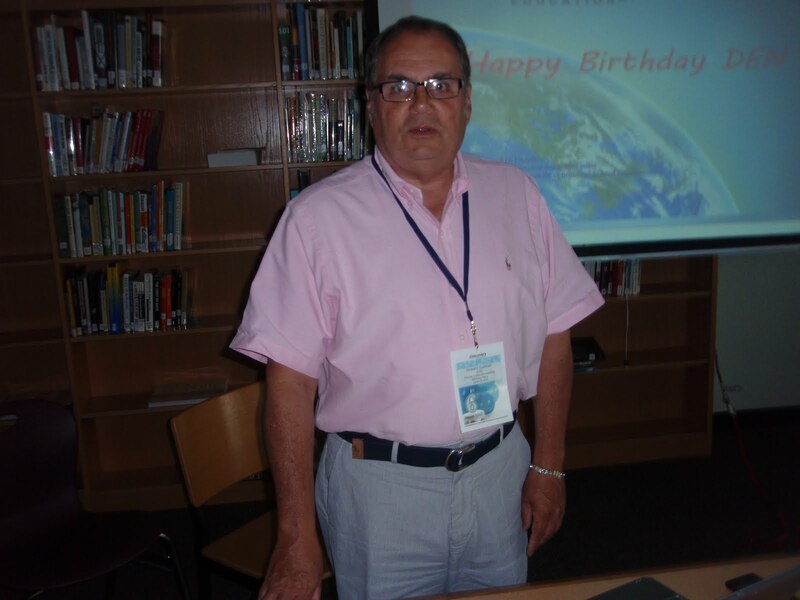 Howard Gunther is a technology integrator and professional development planner serving 26 school districts in CT. He has been a DEN STAR for the last 5 years and he states he “loves the DEN.” October 23, 2011 is a Discovery weekend of instruction Saturday, golfing and/or wine tour Sunday, and their National Conference Monday. Stay tuned to the Connecticut LC Blog. Howard began with The Lightning Thief, a perfect text, as he began merging literature with web 2.0. He merges it by beginning with a Google Earth Field Trip to Newport to study architecture, integrating social studies and art history disciplines with on-site hands-on field experience to study Greek architecture and gather multimedia data collection. Returning to the classroom, Howard’s teachers segue to Discovery Education selected videos. Then they used Edmodo for sharing project design and integrated aspects of the Web 2.0 process of building a robust GE Lit Trip. This project also embeds podcasts, VoiceThreads and a number of other web 2.0 tools. I am a huge fan of VoiceThread and have used it with great success with PBL; we asked our students to record in 3 languages and engage their parents in comments as well. Brings the entire community easily into the learning and teaching process. Howard says that this collaborative interdisciplinary project was a paradigm shift to teaching to any standards/content with a rational, pedagogical justification for student engagement. Initially, this project experienced some difficulty with the IT, since the educational version of many of these tools did not exist. Still, without the .edu versions, they were able to participate (after making a case for it during several conversations) with wonderful success. Sites were unblocked because the uses were legitimate and promoted authentic learning. The project continued with Discoverystreaming, using vetted videos saved to Discovery Builders and then uploaded (final projects) to media share. From DEN STAR Lee Kolbert‘s Palm Beach Cafe on using DiscoveryStreaming comes this wonderful instructional video. Students had individual access, and project leaders incorporated writing prompts and podcasting. Instead of creating student podcasts, students recorded celebrity podcasts of their chapters. As they proceeded with the program, the celebrity podcasts were used to identify the speaker/reader. Music, art, and social studies married to literature produced an amazing result, as we heard in a snipped of one celebrity caster, aka a teacher. Edmodo was incorporated into the learning design; Howard said they liked it because it has the look and feel of Facebook. 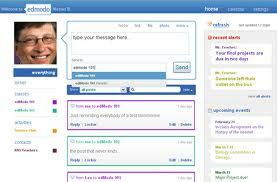 Edmodo has an iPhone, iTouch, iPad, and Droid app, so it is ubiquitous and easily used in any device. Next year, students will experience an open campus with students enabled to bring their favorite device to school to learn. For students who cannot afford a device, the districts will provide eBooks, opening up a 1:1 initiative networked throghout the system. Grades can be exported to Excel and then uploaded to their grading system. In spite of, or perhaps because of budget cuts to education, districts throughout many states are embracing an advancement of use of student devices to offset district expenditures. Glogster, an electronic poster board (use .edu version–free) Anything, pdf, Word, graphic, text, video, images–anything–can be added to the board. For some schools in CT, Glogster becomes a student’s portfolio, carrying a student’s work throughout his/her academic years. A favorite tool of teachers and students, VoiceThread enables collaboration using a varied menu of comment options: type, record,video,telephone (like gCast when it was free), maps, cartoons–you get the idea–lots of versatility here. When I used VT in 11th grade, our students responded in 3 languages, engaged their parents as well as other classes. This tool has marvelous flexibility and unlimited possibilities for all grade levels and subjects. Word clouds–Wordle, Tagxedo, and other cloud devices to aggregate content. Word clouds are excellent ways for students to find main ideas in a text. Think about: copy/pasting students’ writing assignments to Wordle to provide a visual on redundancy. Wordle each revision to track improvement. Use for vocabulary improvement as well on your projects. Tagxedo presents a greater learning curve because you create an image filled with text. 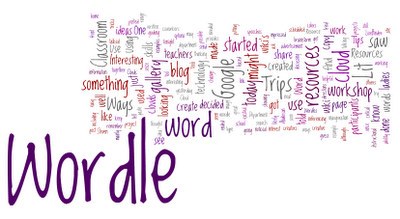 You can google an image and use that as well; lighter images with less fill and more outline work better in Tagxedo. In the educational use of Animoto, you can extend your 30 second free version by googling Animoto in Education for a code which will extend videos past 30 seconds. The code is free, but you must apply. You can add your own images, short video snippets, and your own music. Or you can work from their image/sound bank. Like the tools mentioned in this presentation, this tool gives you embeddable code. If there is a go-to tool that my students LOVE, it’s Animoto. Here’s a quick tutorial, although this tool is so intuitive, your students will likely just jump on and do it. Google Lit Trips are the jewel in the crown of web 2.0 tools. Google lit trips to see an aggregate of existing trips you might use in an educational setting, based on grade and subject level. You can also add your own. If you are working on a text that takes the reader through a variety of locations, Google Earth is an excellent vehicle for creating a lit trip (not to be confused with a field trip which is less robust endeavor). From flyovers to embedding Discoverystreaming, Discovery Builders, or Discovery Writing Prompts, a Google Lit Trip is an expansive and robust tool for your students. When asked at the end of the session, Howard said that each tech integration piece had a separate rubric, and students were given a project design at the beginning so they would have a scope and sequence for this larger project. The endgame is the Google Lit Trip, where all the web 2.0 components are housed and live as a resource for this humanities project. You can find Howard’s resources on his wiki at http://my-tech-wiki.wikispaces.com/. You can contact Howard at hgunther@aces.org.